First Passage – Chapter 20: Who’s there? 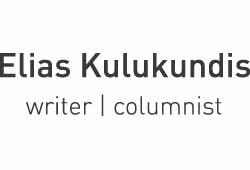 Elias, the Kulukundis? At the Athens airport, we met up with my cousin Miles, who had also come to Greece without his parents. Miles had flown via London whereas we flew directly from New York. We all arrived in Athens at roughly the same time, and we were all met at the airport by Diakos, the family company’s acolyte and factotum, a man with a bald head and tufts of hair growing at his temples and out of his ears. Diakos (meaning Deacon) said something to the customs official who drew a little chalk hieroglyph on every piece of our luggage, and we were free to go, but if Diakos hadn’t been there, it would have taken us more than an hour to get through customs. A car and driver met us at the airport and drove us along the shore road to Singrou Avenue, the main boulevard leading into Athens. Diakos sat in the front seat with the driver, and the three of us sat in the back seat. We ranged in age from Stathe at age 17, Miles at 20, and finally me at 22. Meanwhile, from where I was sitting in the rear right corner, I tried not to believe what my eyes were telling me, that our car was driving in the wrong lane directly toward a car coming towards us in the opposite direction. And this wasn’t England. But at the moment, the big one could not have talked in any language to save his life. He was trying to save his life by not talking, by sitting rigid and breathless with fear, pressing the back of his neck into the seat behind him and staring at the cars coming toward him as the tires of our car bounced back and forth along the cats-eyes in the middle of the road. At the Hotel Grande Bretagne, where rooms had been reserved for us, a row of bell-boys in pale blue uniforms lined up as an honor guard to welcome us. Our minder Diakos stayed with us to make sure everything happened as planned. Diakos helped us fill out the forms at the reception, and when the man gave us each a key, Diakos took his leave and said we were expected at Uncle John’s that evening for dinner. He wrote Uncle John’ address on a piece of paper and gave the paper to me. He said dinner at Uncle John’s was served promptly at nine o’clock, and we shouldn’t be late. Diakos didn’t have to say any of that. Whether we went to London or Athens, we were always expected for dinner at Uncle John’s. (He lived in both places.) In either city, if you didn’t call and make known your arrival, Uncle John might hear of it from other sources, and eventually you would hear about it from your father–that is from my father–and that would be bad news. The address on the paper read number 3, Neophytou Douka Street. There were no taxis to be had, but I had been there before and it wasn’t far, so I thought we could walk. We set out from the Grande Bretagne, crossed the broad boulevard just before it turns into Panepistimiou Street past the Parliament Building. Then we turned right and walked up Queen Sophia Boulevard toward the suburbs. On the left, we came to a side street, Neophytou Vamva. We kept going, and the street after that was Neophytou Douka. We turned left and approached an up-scale building with marble steps and an iron grid on the door marked with the number 3. We looked at the row of names on the buzzer, but there was no Kulukundis or Kouloukountis. “Maybe it’s on the other street,” I said. “The one we just passed–Neophytou Vamva.” The names were so similar that we might have mixed them up. We walked back a block, and there, on the left hand side, in exactly the same position, was a building with a similar façade of marble and iron–3, Neophytou Vamva. We looked at the list of names by the buzzers and sure enough, there was an I. Kouloukountis, the I., we knew, standing for “Ioannis” or John in Greek. We rang the doorbell, and on the intercom a woman’s muffled voice said, “Pios einai?”, Who is it? “O Elias kai o Stathis,” I said. “Kai o Miles,” I added, to be fair. 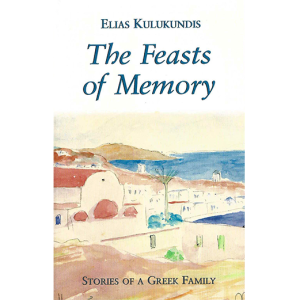 “O Elias kai o Stathis,” I repeated. Never mind about Miles. Let Miles speak for himself. This time I said just my name. 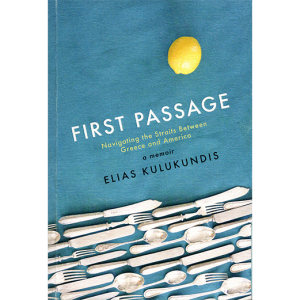 To say your last name in Greek, you have to repeat the article before the surname, which I always thought sounded pretentious–Elias, the Kulukundis, as though you were a Saxon king, one with a peculiar monniker to be sure. 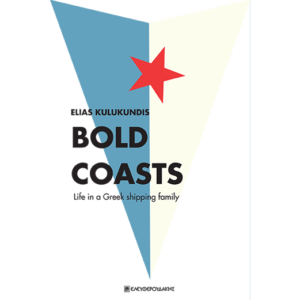 Also, saying you were Elias the Kulukundis when you were at Uncle John’s house was coals to Newcastle–it didn’t distinguish you from Uncle John’s first son Elias, who was also Elias the Kulukundis. 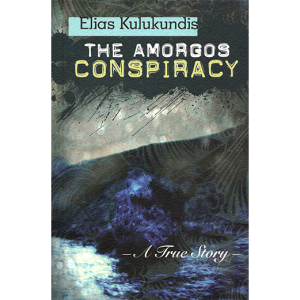 (Elias the other Kulukundis, in fact Elias one of six.) Anyway, we were expected for dinner, so why the third degree about who we were? The buzzer sounded, and we pushed the door open into a marble foyer. At the other end was the door to the elevator. We pressed the call button. The light in the elevator came on, and I opened the door and pressed the button for the fifth floor, which we knew from the list of names on the elevator was where John the Kulukundis lived. With a shudder, the elevator started and we could see the cross-section of each floor as it passed below. At the fifth, the elevator jolted to a stop. We pushed the door open and found ourselves in a dark corridor. At the other end, a door was open, and a woman in a black cowl was outlined against the light. Behind her was another woman, and in front of these two, another. We looked around in confusion. Who were these women? And where was Uncle John? “Kalosta, kalosta!” (Welcome!) one of the women exclaimed suddenly. Miles and Stathe looked at me, wondering where I had brought us. The old woman in the cowl seemed to be in charge, and the other two were her sidekicks. But who was she? We couldn’t very well ask her,; you can’t ask who somebody is after you have rung her door-bell. I was beginning to feel anxious. It was getting late. One of the ladies disappeared, then came back with a tray containing three glass dishes with syrupy fruits and three glasses of water. That was bad news. Extremely bad. 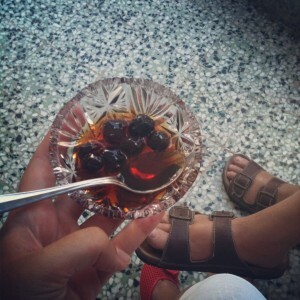 A syrupy fruit is a gesture of hospitality, and you have to accept it. There is no saying no to a syrupy fruit. I never met a syrupy fruit I didn’t eat. But syrupy fruits are not served before dinner. A syrupy fruit is not an hors d’oeuvre. If you see one coming your way, accept it and scoff it down immediately because you can be certain you won’t be getting anything else. By then it was a sure thing we were in the wrong house. We were already late for dinner at Uncle John’s, and I didn’t want to be messing about somewhere else entirely, getting syrup on my tie. Find out how the boys got out of this syrupy mess.